A large hill fort with well preserved ditches/ramparts and the remains of a Roman military camp. Superb views over the surrounding countryside. Hill fort is managed by the National Trust. 1. The River Axe seems to have acted as the western boundary for the Durotriges, the tribe who probably occupied Hod Hill by the first century AD. Their territory extended westwards including all of Dorset and parts of Devon, Somerset and Wiltshire. 2. Hod Hill is one of a chain of hill forts that extended from the port at Hengistbury. It seems likely there was a major trade route to/from there that extended north to Dudsbury Camp, Badbury Rings, Spetisbury Rings, Hod Hill and Hambledon Hill. Roman Fort. The Second Augustan Legion seized Hod Hill sometime after AD 43 as they advanced into the South West. They built a Legionary base, characterised by the standard ‘playing card’ layout, in the north west corner of the hill fort. Notes: Located to the north west of Stourpaine. Follow the A350 and turn onto an unnamed road marked for Hanford. Hod Hill itself is not sign-posted. There is a small car park followed by a moderately steep climb to the summit. Overlooking the River Stour, Hod Hill developed into a large Iron Age community consisting of over two hundred round houses. However, when the Romans arrived in the mid-first century AD, the resident Durotriges resisted the conquest and the hill fort was seized. The settlement was disbanded and it was used for a few years as a Roman military base. Occupying the entire crest of a hill, an isolated part of the Dorset Chalk escarpment, Hod Hill was fortified no later than the fifth century BC; perhaps indicative of the increasing status of the area as it started to thrive on trade from the nearby port at Hengistbury. Occupied by members of the Durotriges tribe, whose domain included all of Dorset, by the first century AD it was densely populated with hundreds of round huts laid out broadly on street lines. The defences were bivallate, namely two ditches, with the inner rampart probably topped by a palisade. The only entrances to the Iron Age fort were on the north east and south west sides and were originally simply protected by an additional rampart that formed an in-turned arm. In the north east corner, undoubtedly the entrance at most risk of attack due to the shallower ascent to the hill fort from this direction, this was later upgraded into a hornwork - a narrow access overlooked by taller ramparts/towers similar to a medieval barbican. The Romans invaded Britannia in AD 43 and in the immediate aftermath the Second Augustan Legion (Legio II Augusta), under the command of the future emperor Vespasian, was tasked with pacification of the South West. 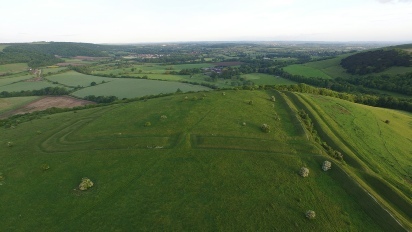 Contemporary records note they assaulted and seized multiple hill forts and, like nearby Maiden Castle, there is clear evidence of their conquest at Hod Hill. In particular a large number of ballista bolts, arrow like shots fired from a large crossbow like device, have been recovered. The Romans seem to have concentrated their fire on a particularly large round hut, further protected by its own palisade, which was presumably a building of some importance. However, unlike at Maiden Castle or South Cadbury, no mass graves have yet been discovered suggesting there was no massacre although archaeological evidence does point to the rapid abandonment of the round houses within the hill fort at this time. Perhaps Hod Hill was surrendered quickly and the populace allowed to leave? 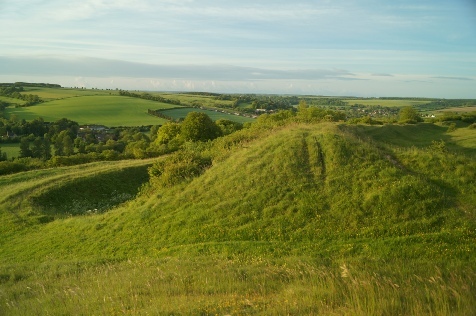 The superb terrain of Hod Hill was not ignored by the Romans who valued both its excellent view of the surrounding area and its proximity to the adjacent River Stour (a main trading route and also the primary method of supplying the garrison). They built a fort within the parameter of the former hill fort configuring it in the standard Roman 'playing card' shape, i.e. a rectangular configuration with rounded corners. The original Western entrance was re-used whilst a new double ditch and rampart protected the east and south sides of the Roman compound portioning it off from the remainder of the fortification. The Romans also added a new penetration in the hill fort's southern rampart improving access to the River Stour. The Romans garrisoned a Legionary cohort here (around 500 men) who were augmented with a cavalry detachment around 250 strong. It was abandoned in AD 51 as military priorities changed.